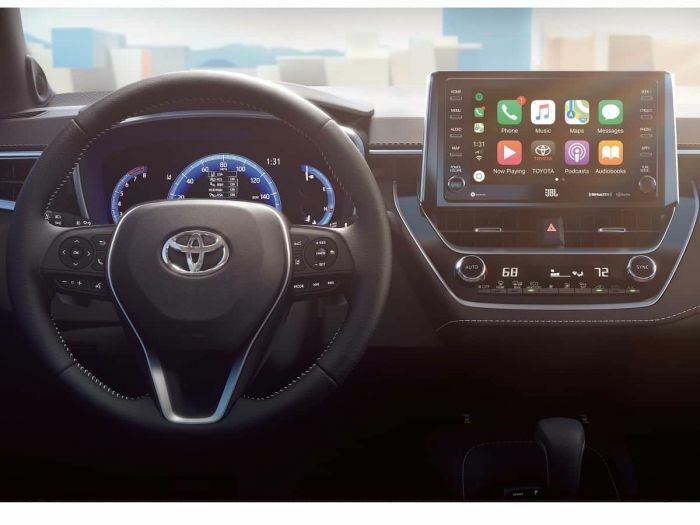 Toyota's newest vehicle launches for 2019 now feature Apple Car Play integration. This is a move away from the poorly-rated Scout navigation app Toyota had previously offered owners. In a surprise move, the new 2019 Corolla Hatchback also features Alexa integration as well. This is a sea change for Toyota, one of the last major automakers to have adopted Apple Car Play. There is still no indication that Android Auto is coming. Android has a majority share of the smartphone market in America and globally Samsung's smartphones running Android dominate the marketplace. Toyota has kept the switch to Apple Car Play relatively quiet. That could be due to the fact that almost all Toyota's currently in stock lack this now-common feature. As the new generations of popular models roll out, the tune may change. The new 2018 Camry does not feature this technology, but the 2019 Avalon has Apple Car Play and the new Corolla Hatch has Apple Car Play and Alexa. The new Apple Car Play and Alexa integration is not a special package in the 2019 Corolla Hatch. Both the SE and XSE Entune 3.0-equipped cars come with the features.